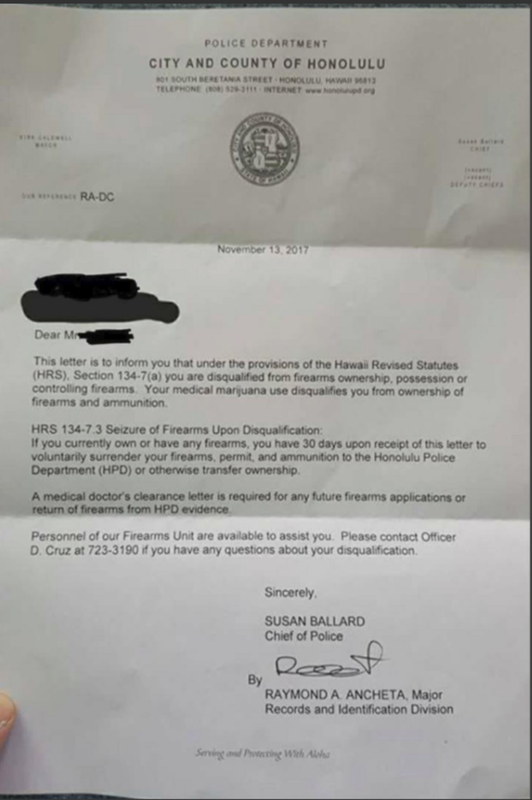 Gun owners in Hawaii who legally use medical cannabis have been told they have 30 days to “voluntarily surrender” their firearms to the police. Residents in Honolulu, Hawaii, were recently informed that if they use cannabis for medicinal purposes, they will be given 30 days to “voluntarily surrender” their firearms and ammunition before the Honolulu Police Department begins confiscation. The letter from Chief Ballard starts off by claiming that its purpose is to inform the residents of a revised statute. “You are disqualified from firearms ownership, possession or controlling firearms. Your medical marijuana use disqualifies you from ownership of firearms and ammunition,” Ballard wrote. The letter references H.R.S. 134-7.3, which dictates “Seizure of Firearms Upon Disqualification.” Ballard claimed that residents have until Dec. 13 to “voluntary surrender” their firearms, in order to be in compliance with the law. This order serves as another reminder of the clash between state law and federal law. While medical cannabis is legal in Hawaii and the state’s first dispensary opened in August, it is still illegal under federal law. In fact, according to the United States government, the cannabis plant is one of the most dangerous drugs in existence, and has no medicinal value whatsoever—despite a wealth of evidence that proves otherwise. As The Free Thought Project has documented, not only has pure cannabis never been found to make its user more violent, but research continues to prove its medicinal benefits. These studies include evidence that cannabis can stop HIV from becoming AIDS, that the majority of cannabis users give up prescription opiate medications, and that cannabis has a “significant” effect on killing cancer cells. There is also a level of hypocrisy when taking into account the fact that many of the prescription drugs individuals are prescribed for illnesses and symptoms that could have been healed naturally with cannabis, contain dangerous and life-threatening side effects. In fact, several of the recent mass shootings such as the Las Vegas shooting, which killed 58 people; and the Orlando shooting, which killed 49 people; were carried out by suspects who were under the influence of psychotropic drugs, which can cause aggressive or violent behavior.